Let’s watch the magic of caramel unfurl in this all-time favourite Mexican dessert. The Caramel Custard is an absolutely fab creation featuring luscious custard baked in attractive caramelized moulds. Ragi custard is an innovative dessert recipe with ragi or Nachni added to the milk and then baked till done. The soft and spongy ragi custard is delicious in taste, appealing in looks and also enriched with nutrient benefits of ragi and milk. Crispy from outer, soft from inside with sweetness of condensed milk. Custard pudding is a cool and yummy dessert .It refreshes and it tastes like rabri .It is a mouth melting dessert when it is served chilled I have made this many times. Me and my family enjoyed it every time specially in the summers. Avocado Custard is a divine dessert recipe with fresh ripe avocadoes blended with condensed milk and served chilled garnished with strawberries. 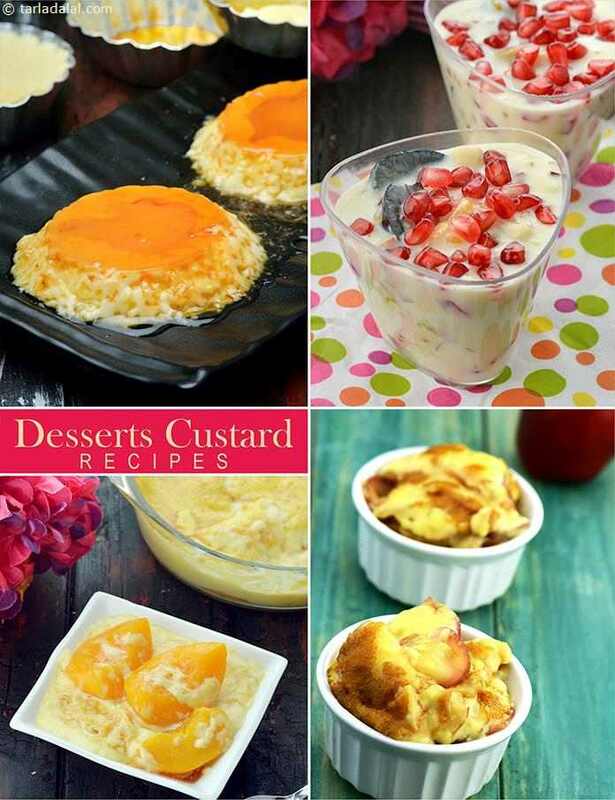 A gourmet delight - Cheese Custard dessert is concocted from a heady mix of the Western cheese and an Indian all time favorite - Sweet Custard. Add the fruits to poha custard to increase its nutritive value, flavour, texture and appearance. Mango Custard" can be one of scrumptious dessert you can opt for your li'l one. I usually prepare it in the morning and keep it in refrigerator and when my kid comes back from school, she gets delighted finding a big bowl of her favorite custard with a cherry on top.